Google Poetics, or the art of the “autocomplete” has become a genre, as can be observed in works such as “Autocompleteme” by Jérôme Saint Clair and Benjamin Gaulon, or “Google Poems” by Sampsa Nuotio. Some of their strength is in the use of the Google AutoComplete engine, which is not a static technology, but one that evolves through elaborated new software mechanisms and the sophisticated huge corpus that it draws from. As such, “Glacier” by Zach Gage is a work that tries to conceptually capitalize on these characteristics. It’s made out of customized hardware and software and wood, as an eternal generative frame. Its unique poems are generated via the top three results for a specific prompt to Google AutoComplete, which refreshes once a day (and eventually changes the title, too). This ever-changing generated literature is strictly connected to one online multinational firm and its policy, but Gage seems to focus more on the literary impact than on its digital legacy. edited by Rasa Smite, Raitis Smits, Lev Manovich – Data Drift. 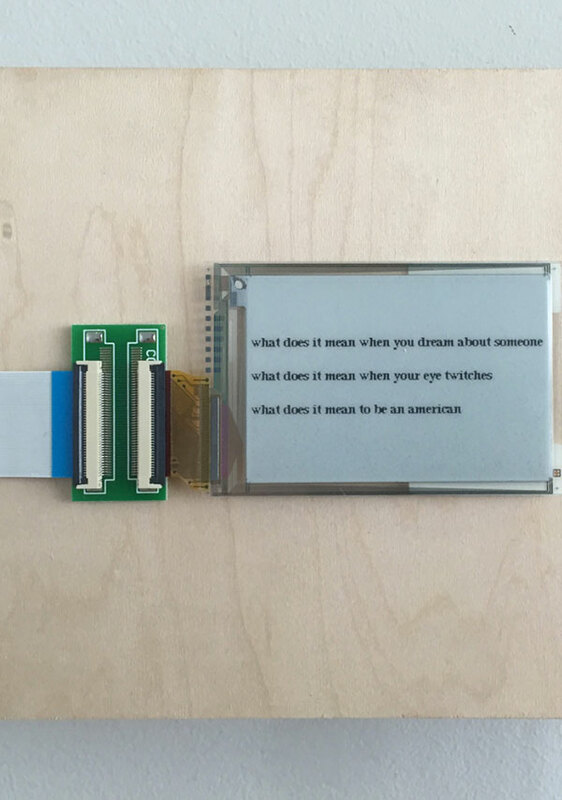 Archiving Media and Data Art in the 21st Century.